Shivendra Singh Dungarpur is the director of Celluloid Man, the acclaimed documentary portrait of P.K. Nair (pictured above, left, with Dungarpur, right). Nair is among the most iconic and important cinephiles in the world, whose founding of the National Film Archive of India in 1964 has ensured the preservation of his country’s cinematic history, its earliest pioneers, studios, and masters. I was lucky to talk with Dungarpur at London’s Mandeville Hotel, where we discussed Celluloid Man, his recently founded Film Heritage Foundation, and the work he has undertaken as a historian and archivist. Michael Ewins: Nair talks in the film about his earliest memories of cinema, sitting in the tents on the sandy floor, and how he was awakened to cinema’s power by films like The Bicycle Thieves and Rashomon. I wonder about your earliest memories of cinema – both in terms of the films you loved as a child, and those which developed your passion for cinema; maybe the films which put you on the path toward becoming a filmmaker and archivist? Shivendra Dungarpur: I think one of my most important memories… during summer vacations I would go to my paternal grandfather’s house, way back in Eastern India, in a state called Bihar, a small town called Dumraon. My grandfather every evening would showcase us films of Charlie Chaplin and Laurel & Hardy, and he had a projectionist who would come in. It was a very adventurous time for us because our summer holidays were interwoven with fishing and a lot of activities… and we would come back in the evening, and me and my brother, and a few of our cousins would all gather, and this projectionist would come and remove the projector’s covers, and these cans were taken out. I think the very first impression… the smell of those films. We were absolutely fascinated, and I was always fascinated to stay next to the projector, so I could see the threading of the film. When you thread the film you will have these characters, Chaplin, upside down, and then you’d see him projected straight up. That whole magic of films, I think, was thanks to my grandfather showing me those things. But very early I was expoosed to a lot of Indian films. My grandmother was absolutely fascinated with films. We would travel to see two films in a day, in a movie theatre, watching films after films. But I think it was later, when I was studying in a boarding school in North India, when I was really figuring out that it’s a director who makes films, and there’s a filmmaker behind this, and I think the journey from there to working with somebody in Bombay and getting into a film institute in Pune… but I was very clear from the school days that I want to be a part of films. My life has to be revolving around films, and I want to be a filmmaker. Then I started working with a great filmmaker from India, a poet, a lyricist, called Gulzar. He exposed me to video cassettes of the early films of [Satyajit] Ray, but until then I had no idea that films like that were made also. I knew only about the commercial industry, the films that my grandmother showed me of Raj Kapoor and Bimal Roy. And suddenly I started feeling that there is so much more to cinema than the films I have known. I started relating to that, and he [Gulzar] said that the only place that you can learn is the Film Institute in Pune. In this one week, I was shown, as a boy who has never been exposed to world cinema, growing up on popular Hindi films and Hollywood films, I was exposed to Tarkovsky; Ozu; Bresson; Antonioni. It just threw me into a different world. I knew now that I would live for films, but all of this was only possible thanks to one man, P.K. Nair. ME: I read that you completed your degree in History. I’ve always thought it important to have a knowledge of history to be involved in film; cinema is a way of remembering, and whether a documentary capturing recent events, or fiction films recreating the past, all cinema follows its own historiographic narrative. How much do you agree with that, and consider a background in history useful to being a film critic, or a filmmaker and archivist? SD: I completely agree. Whether it’s the history of mankind, the history of a country, or history of any aspect, the ability to look at history through world cinema… we can relate to it much better. Unless we know where we came from, we won’t know where to go. And the only way to look ahead is to look back. You have to keep looking back, so in that sense I’m very happy that I did history, and I was able to relate to the history of moving images. ME: I understand that the initial concept for this documentary has its origin in a conversation you were having with fellow cinephiles – if you remember, what was the topic of that conversation, and how did it lead to Celluloid Man as it exists now? SD: My whole journey began when I read an interview with Scorsese, where he said that these films are restored in a place called Bologna, and it was just nostalgic for me, to look back and think about my time with my grandparents, and the wonderful time I had as a student at FTII (Film and Television Institute of India). The question before I went to meet Nair Saab was, where is Nair Saab? During my trip to Bologna, when I was watching those beautiful films, I was only thinking of P.K. Nair. I was transported into the world Nair had created for me when I was a student. I couldn’t believe that these beautiful images could bring back so many memories and lives. This is important in a country like India where films are religious, it’s interwoven… we link to each other with films, we know each other with films. When I came back I made it a point that I had to meet P.K. Nair. At that time a similar thought came to me that I had to make a film, so I went to Pune with a group of friends. We took Nair to the archives, and when I saw the conditions, I said: what can I do to bring back these films to their previous glory, the way P.K. Nair had collected them. At that point I started thinking that I should shoot a bit with Nair, but wasn’t sure if I should make it into a film. My conversation with my friends was about finding P.K. Nair, where is he living, what is he up to? I knew he had retired, and I think our conversations began about what we can do to make sure that this heritage is looked after. ME: I know that when you approached Nair about the film, he stated that he would like to be a part of it, so long as the focus of the film is the Archive and preservation. I personally think you have made the film he wanted, but also the film you wanted; a portrait of this man who is so important to Indian cinema. SD: The thing is, this film was a very organic process. He [Nair] was very clear right at the beginning, because he’s been battling this cause for preservation for a very long time, and he was clear that there was no point making a film about himself. If you had to make it, it had to be about the importance of preservation in India, and how we can save these films. But as with any organic process, you discover many aspects, and this documentary could never be complete without getting to know P.K. Nair. The balance came by itself. It was just part of a process of receiving. ME: The film makes clear that Nair and the NFAI haven’t had government support, and film preservation isn’t considered by authorities to be worthy of investment of time or money. I wonder how much has changed, if anything at all? SD: Unfortunately, they’ve never cared for India’s cinematic heritage. Out of 1,700 silent films we only have five or six complete films, and maybe another ten, twelve fragments. By 1950 we have lost 80% of our films. So such a large part of our heritage is already gone. If we don’t look at preserving now, it will be too late, and I think the government has to pay to rebuild the infrastructure of the archive, provide the archive with the latest facilities, to make it an autonomous body. We are perhaps the only country in the world who produces such a large number of films. We are making films now in so many industries, seventeen languages. A country which is producing films in such a vast number and doesn’t have a suitable state of archiving… that’s quite shameful. So the government has to look at this, they have to understand that cinema is a part of our national heritage. ME: And what about funding for the production of films? Obviously there is a huge industry in India, but I imagine a film like Celluloid Man doesn’t receive that kind of money. SD: For Indian documentaries there are unfortunately no systems to get funds. There are organizations like Film Division, which funds very small, independent subject films. But generally it’s very difficult, I had no choice but to fund it myself. That’s why it took three years, as I was shooting on film. 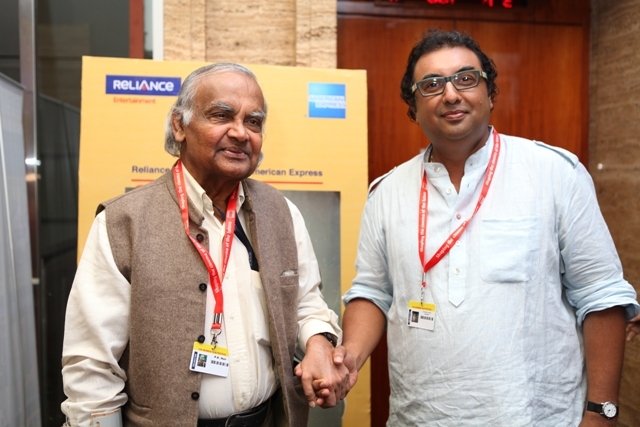 I knew that the only way I could do justice to P.K Nair, a man who collected film, was to shoot on film. ME: There were 11 directors of photography on Celluloid Man. I imagine this was because so many filmmakers are passionate about the subject and about Nair, but I wonder about the practicality of employing so many DoPs. How were they rotated? Did each bring a different skill or a shooting preference to the picture? SD: All of them are from schools in the Film Institute, except one, who has worked with me in several of my commercials. In a film like Celluloid Man, which has so much footage, I wanted to explore the film format. I shot on 16mm, 35mm, Panavision… I just wanted to experiment with different ways of looking. So the idea came to me of having different cameramen. And each one wanted to share their experiences with P.K Nair, so we were all sharing while we were shooting. A few of them I shot with depending on their area, it was more divided as to the region. The portion in Calcutta was filmed with a cameraman who lives in Calcutta, for example. ME: I love how loosely arranged the film is, but there are a few occasions where it deals in blunt statistics, and one of those is that of the 1,700 silent films made in India, only about nine survive. How shocked were you to learn how much of India’s film history had already been lost? SD: I always knew, because Nair would talk about this. All the black and white films, the producers would donate themselves to these agents who would actually remove silver from the reels, and colour from the colour films. The colour dye was used for bangles. So a lot of our films got destroyed, and it’s common that if they discover a black and white film, they do it right away. ME: So many filmmakers and critics express their admiration of Nair in the film, and I get the sense that many of them hold him responsible for shaping the history of cinema in India, especially its silent history? SD: When you talk about P.K. Nair, you talk about the history of Indian cinema, because he is singularly responsible for collecting films from different parts of the country. We talk about Bollywood today, but there are four separate Southern Indian film industries, and a Bengali industry… we make films in Punjab. Nair has collected films from every part of the country, and watching them we have been able to write and discover and study, and feel how Indian cinema has evolved from the beginning. Had it not been for Nair, we wouldn’t have had the first Indian film, Raja Harishchandra. No history of Indian cinema can be written without mention of P.K. Nair. ME: I know that you travel the world to meet and interview directors for your own archive. Can you talk about some of the filmmakers you’ve talked with and if these interviews will ever be used, if only perhaps for educational purposes? SD: I have interviews with Manoel de Oliveira, Agnès Varda, Krzysztof Zanussi… Miklós Jancsó, who just passed away recently. But the last interviews I’m shooting are to make a documentary on Jiří Menzel. We have been shooting for three years, and we should be completing it this year. It’s about his films and his life. His films were shown to me by P.K. Nair, Closely Watched Trains… and I think since then I was fascinated. I thought that I should go and discover him, and have conversations with him, and that dialogue will now make a film. The film has evolved out of long conversations we had in Prague, or during his trip to India. The rest of the material I went about in the archival way, of collecting and preserving material. ME: Can you talk about the work you’ve done with Martin Scorsese’s World Cinema Foundation? SD: I facilitated the restoration of Kalpana, a Uday Shankar film from 1948. The other contribution I’m very happy about is the restoration of a Sri Lankan film, Nidhanaya, by Dr. Lester James Peries. He’s 95. He’s Sri Lanka’s biggest filmmaker. He’s won awards at Cannes and Venice, and Scorsese’s Foundation restored that film. Sri Lanka doesn’t have an archive, so it was an important step for them to restore the film. But I was also involved in the BFI’s restoration of Hitchcock’s The Lodger, I was a sponsor. They were running a campaign… I wanted to give my gratitude and thanks to Hitchcock. ME: Can you tell me about Film Heritage Foundation? How likely it is that more of the restorations will find their way to audiences in the UK, as those involved in Scorsese’s WCF will? SD: We have many 35mm films. We will be part of a national campaign to restore films, so we need to identify the most important films in India. And education. We want to take film as an educational tool into schools in small town India, and educate children in the importance of national heritage, but also to talk about different styles of cinema, and show that there is a life beyond Bollywood. There is documentary, experimental, animation. ME: Nair hopes that the film will help to spread awareness about archiving and preservation. How far do you think the film has been a success in this respect, and what are your hopes for it at this point? SD: Not a day goes by in India where I don’t get a call to screen the film, and it went to over 50 international festivals, so we are supremely humbled by the whole experience. And I wanted it to be released in the UK by a distributor which I am very sure of. I met Mehelli Modi [founder of Second Run], and he’s extremely passionate, he’s somebody who’s doing it for the love of cinema, and I’m thankful that he was able to release this DVD in the way I wanted it to be. I’m hoping now it will reach out further, but I’m already very excited that it has done so well.